I received Zoya Belle in the mail from Eleventh Gorgeous after winning their Zoya Blogger Collection giveaway a few weeks ago. I was so excited! I actually thought about picking up the Limited Edition Collection, but hadn't pulled the trigger yet. 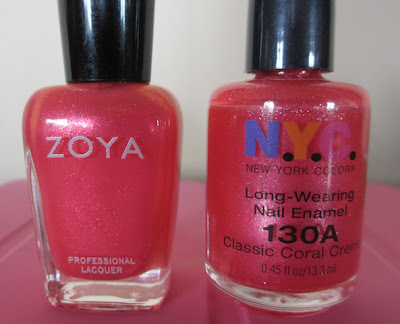 Upon opening the package, Belle caught my eye and it reminded me of another polish I have in my collection - N.Y.C. Classic Coral Creme. They look very similar in the bottle; however, when I swatched them on my nail, I could see a slight difference in the glitter. The N.Y.C. has a little bit more silvery glitter rather than the copper that Belle has. The formula seems very similar - sheer, jelly-like - but I like it! 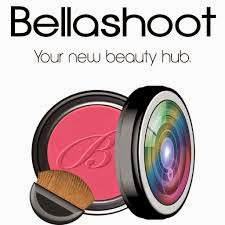 If you missed out on the collection or are interested in just Belle, consider checking out Classic Coral Creme from N.Y.C. Thank you for this post! Belle was the only one I really liked so I didn't wanna order the set. I will look into the NYC one. Good - hopefully it's still available. It's a few years old, but I'm sure N.Y.C. doesn't come out with many new collections...lol.